Left: A little bit of luxury was added to this small powder room by covering the walls in metallic printed grass cloth. 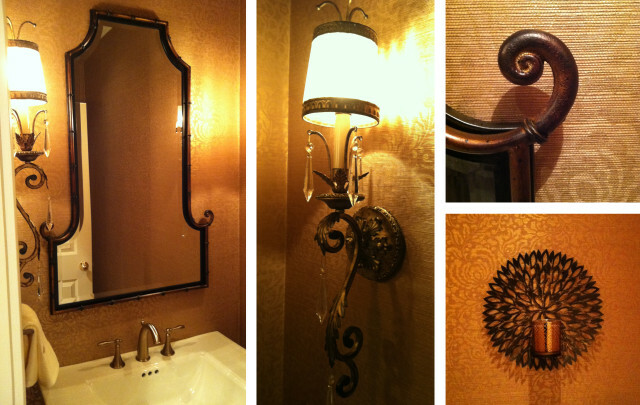 The beautiful bronze sconces were moved to the side walls to improve lighting conditions and create room for a mirror. Middle: Ornate bronze sconces with crystal accents and glass shades create dramatic lighting in the small space. Right/Top: Detail of mirror with bamboo motif. Right/Bottom: The decorative candle sconce is reminiscent of the finish on the mirror. An LED candle on a timer provides safe and convenient ambiance.